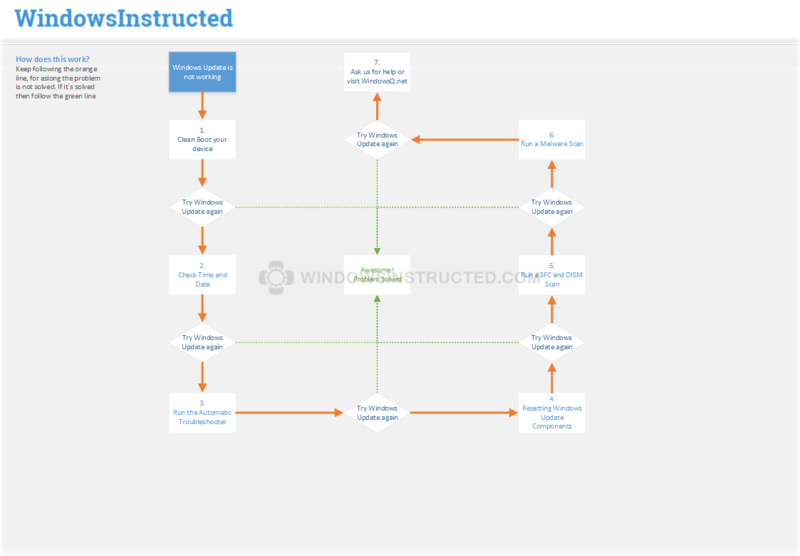 WindowsInstructed receives a lot of traffic each month, and a significant part of that traffic is looking for solutions for Windows Update Problems. We have around 50 articles for very specific Windows problems but sometimes people simply don’t get an error code, or the error code is simply solvable with common troubleshooting steps. For those occasions I wrote this article, It covers all steps you’ll need to execute to make sure that their really is a problem. Please be aware that while this document is huge, the steps are sorted, I mean by that, that the most common solutions are at the top and the least common solutions are down in the list. I hope that you’ll find your solution below. And please don’t hesitate to share this post on your favorite social media, perhaps it can help your friends, like it helped you (I hope)! During the entire article we assume you have access to an account on the system with Administrator Rights. 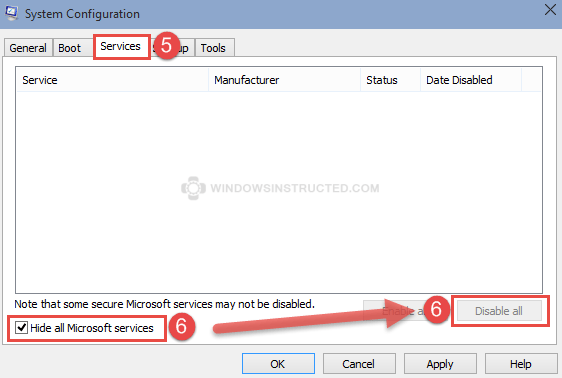 We suggest you make a system restore point before continuing with this article. We are going to give you some steps to avoid Windows Update Failing to Install Updates or any other Windows Update fails. Checking your time and date. 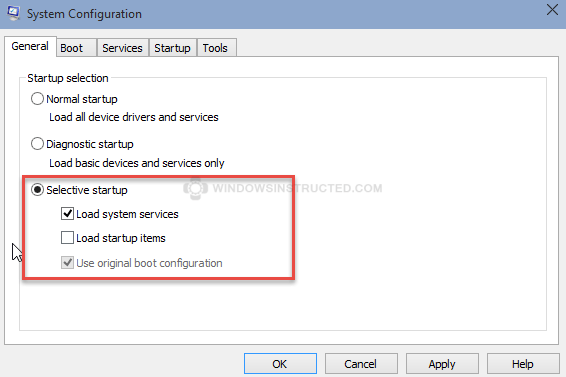 This step should really never be skipped, a very common reason for update problems is that you have a service or program running that is causing problems with the Windows Update services or components of it. This can be diagnosed by clean booting your device and then try if updates are now successfully applying. 2. Checking your time and date. A common reason for Windows Update not working is that your time and date does not match the Microsoft Update servers. We did not have time yet, to test this on Windows 10. We assume the troubleshooter will not work since it’s designed for Windows 8 and will most likely give the error that it is not compatible with Windows 10. 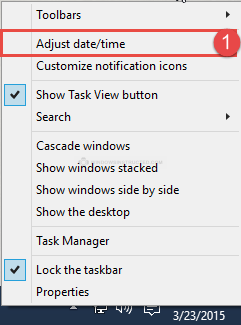 Windows 10 Users should skip this step. Microsoft has released an automatic troubleshooter to find and solve common Windows Update problems, we suggest you give this a try. We hear very good things about it. Then try to run Windows Update again, continue if it still does not work properly. In most cases the downloaded data is just corrupted and removing this data can help making Windows update again. Wait for the results to come back. DISM will now start scanning and trying to fix any problems it finds within the image, it’s normal to get stuck at 20% just wait patiently. If you receive no error’s at all then try to run the Update again, if it fails then continue reading on the next page. A reason Windows Update might not be working can be a Malware Infection, let’s take a look and see it that is the case. Reboot your device and look if Windows Update is now working, if it’s not then continue to the next page. Thank you. This fix my problem even thought I wasn’t getting any error messages. Just “Windows could not complete updates. Restoring to previous settings.” After trying steps 1-3 of your troubleshooting article and those didn’t change anything, although step 4 was the solution. When it came to the step for stopping the msiserver is said it wasn’t started. When it was time to start the msiserver the response was that msiserver was not responding to conrtol. So I rebooted and went back to cmd prompt for admin and tried starting the msiserver. This time it started and then I went back to check for updates. It found 34 important updates which I proceeded to allow windows to install. This time all went well and now my HP ENVY dv6 is now up to date and hopefully no more problems like this.